My son decided that he wanted to make a Meatball Pie for a family gathering, and it knocked everyone’s socks off. This all started when my mom decided to host a different sort of family dinner, and she created the Great Pie Challenge of 2017. She invited the whole family to bring their best pies to compete. I was going to make a few of my favorites to take, but the kids decided they wanted in on the action too. 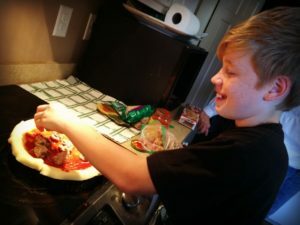 From the very beginning Max wanted to create a Meatball Pie, and I admit…I was intrigued! I always have a freezer full of homemade meatballs for quick dinners, so we would not need to buy many ingredients to put his special culinary concoction together. Max and I tossed ideas back and forth for a week until he landed upon exactly how he wanted to create his masterpiece. And the finished product drew great reviews, and also a few prizes! My favorite thing about him creating this pie was watching him confidently and comfortably create and cook the Meatball Pie. I love watching my kids get creative in the kitchen. It should also be noted that we did not call it the Meatball Pie at the Great Pie Challenge of 2017. 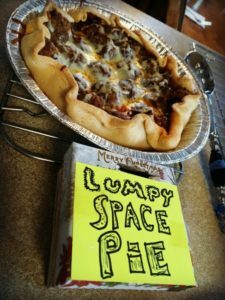 One of the requirements of the competition was that each chef had to come up with a unique name for their pie, and Max dubbed his the “Lumpy Space Pie”, which is not a very tasty sounding name, but it sure made us laugh, and won him the “best name” award along with best taste. 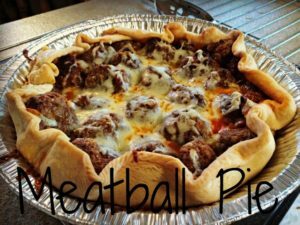 The Meatball Pie recipe is super simple and scrumptious. I must say that I think a key to this Meatball Pie being so tasty is that instead of resorting to using frozen meatballs he used some of my homemade meatballs that I keep on hand in the deep freeze. So grab your favorite meatballs and put this super easy Meatball Pie together for dinner tonight. I would be willing to bet it will be a crowd-pleaser at your house too! Lay pie crust in a 9 inch pie plate (ungreased). Spread pizza sauce evenly over the bottom of the pie crust. Put meatballs in a single layer over the sauce. Pull edges of pie crust over the sides and pinch them together a bit. Bake at 375° for 40-45 minutes. Sprinkle Mozzarella on top and bake for about five more minutes, or until cheese is melted. Serve hot. Enjoy! My family LOVED it! My daughter enjoyed learning a new recipe! Thanks so much for sharing!